A swimming pond is a pond that you can swim in, a pond with water lilies, bulrushes and tadpoles around the edge, keeping the water oxygenated and clean, with a swimming area in the middle for you to wallow in cool chemical free water while you admire Mount Chiang Dao. 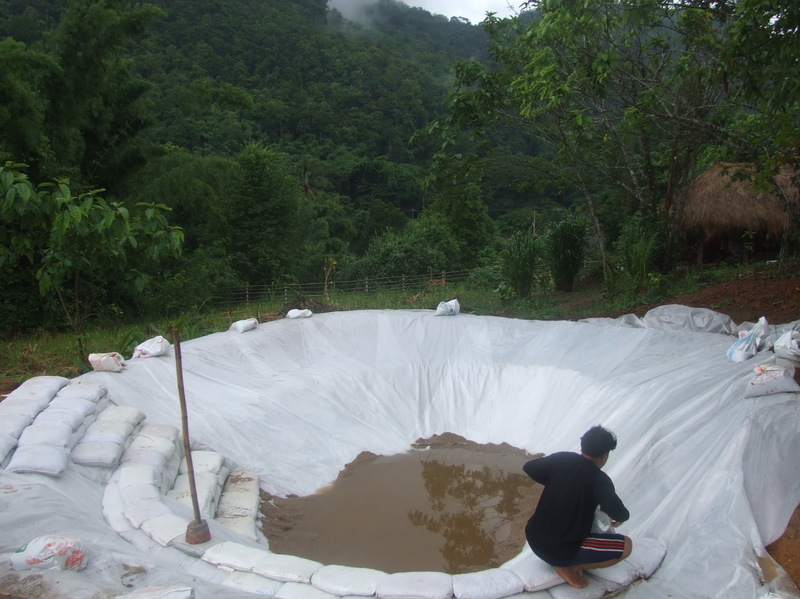 Inspired by David Pagan Butler’s DVD www.organicpools.co.uk and galvanised into action by the heavy rain as the monsoon begins, we took a couple of weeks off from domes to get the plastic in the hole in the ground so that it can fill up with rain. 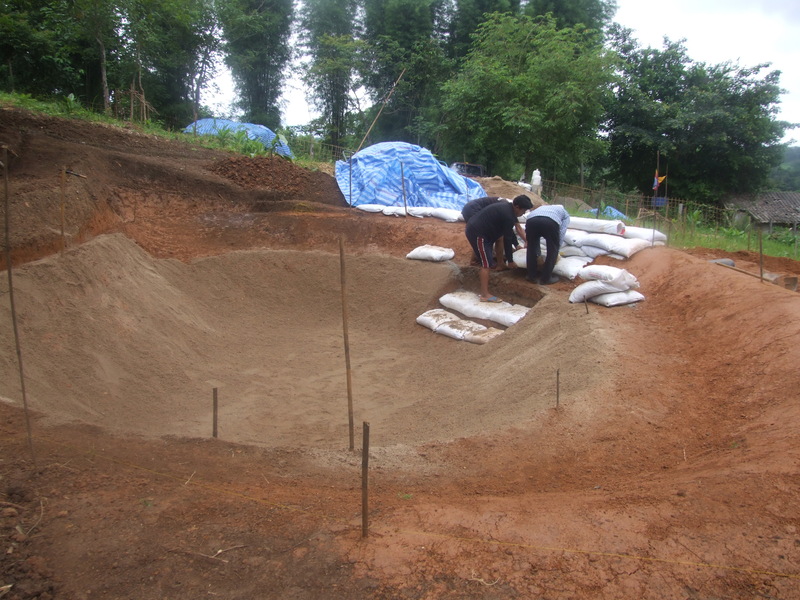 The first step was to find the level for the water when the pond is full, and for the inner submerged wall separating the planted area from the swimming area. 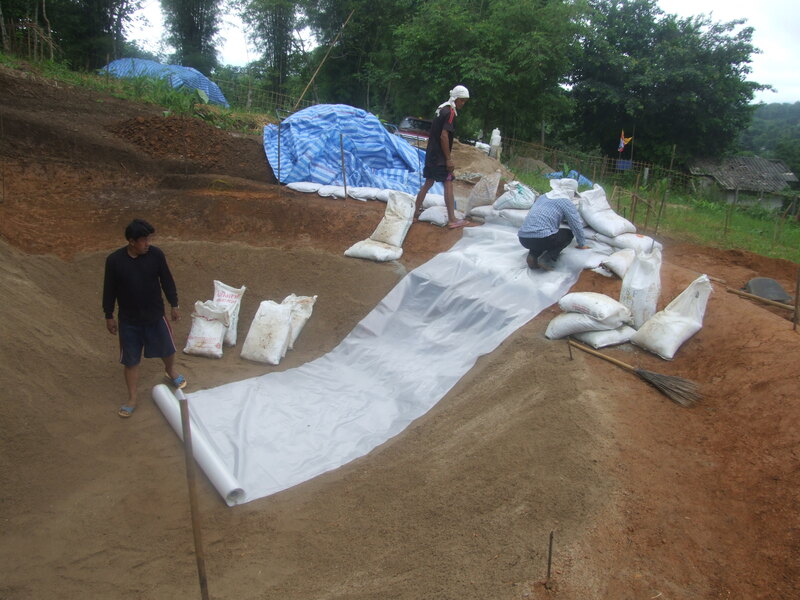 As we are building on a slope, we decided to build up the lower area to make sure there would be a good amount of water in the centre, which will be just over a meter deep. This will not be the kind of pool for swimming lengths, more a pond to cool off in during hot afternoons. I can see myself sitting on a step up to my shoulders in cool water, watching the clouds swirl around Mount Chiang Dao. And so steps are essential! We used polypropylene bags filled with a mix of dry sand, stones and cement to make building blocks. When wet the mix should set into concrete, and when the bags disintegrate, as they eventually will, we can always add some mosaics or pebble in some patterns above the water line. 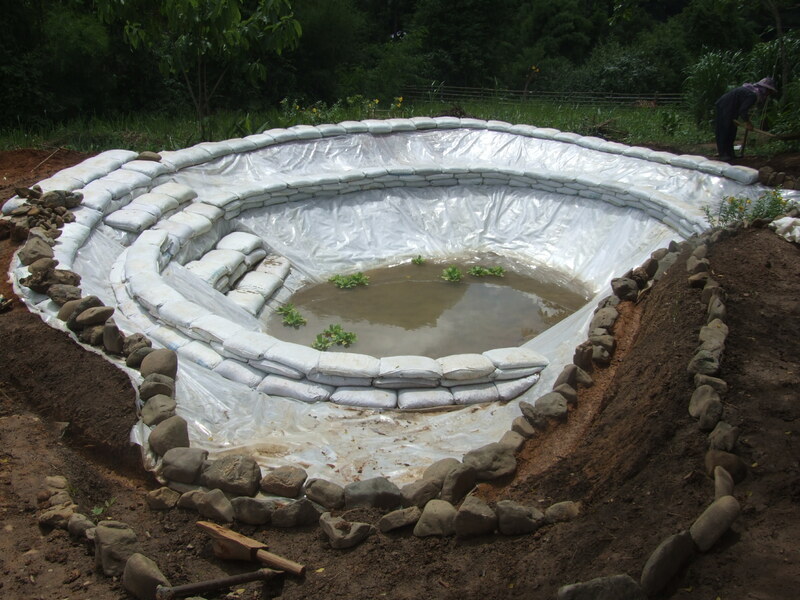 Rolling out the plastic lining for the pond. This was the thickest plastic I could find. However, it is sold to make fish ponds for the commercial cultivation of fish, so I presumed it would be OK for a gentle swimming pond. We put down three layers, just to be sure! Everything is a source or fun for a puppy! Sand bags hold the plastic in place. Not a moment too soon – down came the rain! 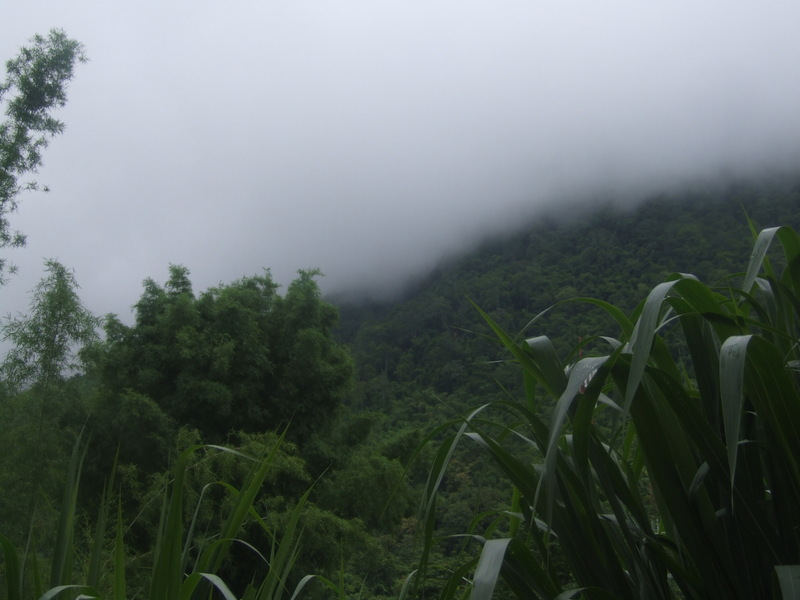 Mount Chiang Dao disappears completely in a rain cloud. 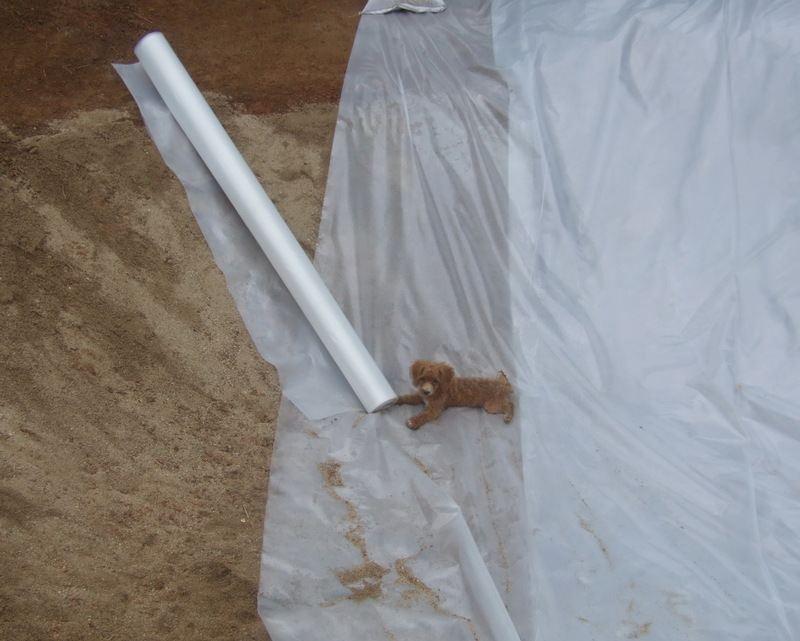 With rain water already gathering, we put sand into the bottom of the pond. This made it easier to walk on and fix the plastic into place, and hopefully will make a ‘mirror’ for reflexions in the pond. I made the choice not to have black plastic, and chose opaque instead, as I think the sky and plants reflecting in the pond should make the water an attractive colour. 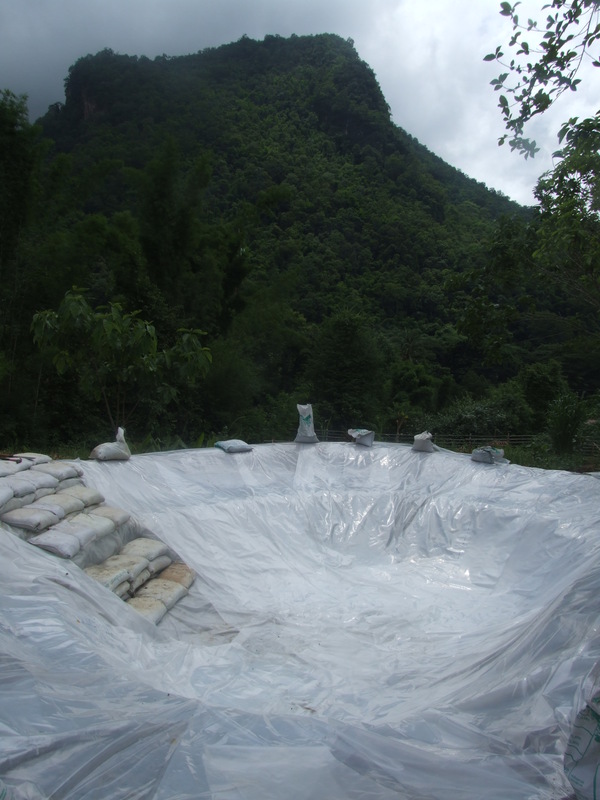 The next step was to make more bags of concrete mix at high water level, and also for the submerged wall separating the planted area from the swimming area. Working on the blocks separating the planted area from the swimming area. Waiting for the rain to fill up the pond! And this is as far as we went. Now it is a matter of waiting for the rain to fill up the pond. I also intend to bring some water from a nearby clear water pond that is well established, so that natural micro organisms can start working in this pond of mine. Next week – back to the Domes again! This entry was posted in Natural Building and tagged chemical free water, swimming pond. Looks great, will be doing a smaller version soon.right now am working,still, in the bathroom. Tomorrow a local artisan is coming to look at the wood we harvested from two dead trees. He was all make two benches for the living room. I also have to build a place for three goats I am due to pick up later in the week. Three sisters, just coming to breeding age. Now to barrow or rent a buck. Three goats! I had one once – she ate everything and was very mischievous and surprisingly intelligent. Paulina Wojciechowska of Earth Hands and Houses will be coming to give a workshop on superadobe here in February if you are interested…. I will post details later this week or you can already find them on Paulina’s website. I hope we can get over there for Paulinas visit but i may be doing a class here at that time.I have some people who are interested and i have 2 5m domes to build. But if you post i will.repost to the web for you. These goats are smaller and we have 2 rai that grow so fast i can’t keep ahead…and i like goat milk and cheese. But i may be willing to sell one doe, three seems a bit much. Perhaps if we stagger the times of our workshops, people can go to both – I am sure we have different techniques! Will be happy to post yours to my contacts either way. Not in the market for a goat just now, but have a friend who might be – will ask and get back to you. Not really sure yet on dates for build at our place. I will not be charging as I need two one room domes. And I will teach how in exchange for labor. I only want 4 to 5 people. If Michael can come it may be a bit more formal…but he is busy on a build and may be looking for a break rather than a build. 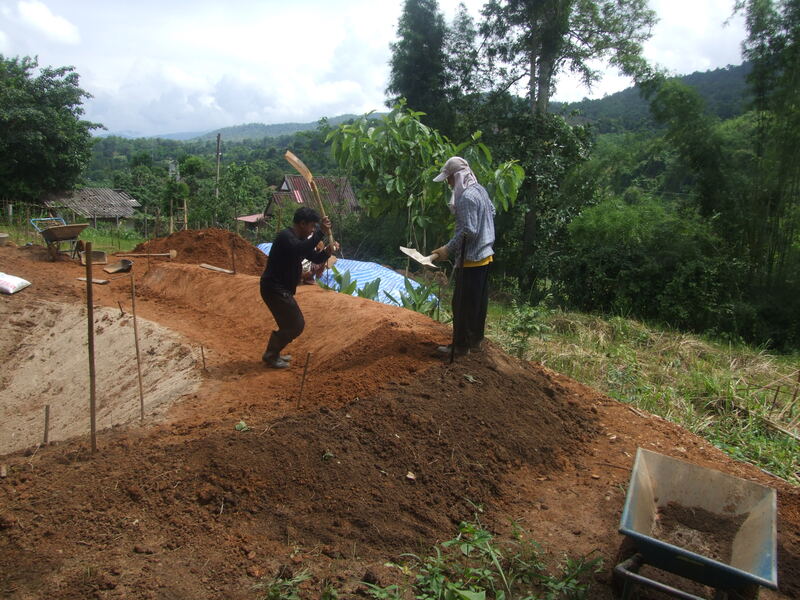 Building with Rice Husks (Hulls): Roundhouse Dome Workshop in Chiang Dao, March 2015. Workshop in Chiang Dao, March 2015.